The 22nd Golden Goat saw BAOC return to the lovely (and arduous!) hills of Pacheco State Park. Twenty-two intrepid orienteers participated in the 12.6 km (865 m climb) Goat, lead by Riley Culburg (2:06:35), Mikkel Conradi (2:08:50), and Greg Khanlarov (2:12:58). Runners could skip three controls, and many different strategies were used​—​although only a small fraction of the possible 9139. Another fifteen participants took on the 7.4 km (450 m climb) Kid, including some "wise goats" who took the option to switch courses part way through the Goat. The Kid was won by Terje Mathisen (1:13:03), one of two participants visiting from Norway, following by Paul Ort (1:17:14), and Daniel Šebo (1:20:05). Irena Stefanova (1:43:52) lead participants on the 4.5 km (220 m climb) Pygmy, followed by Gal and Rami Rivlin (1:52:07). 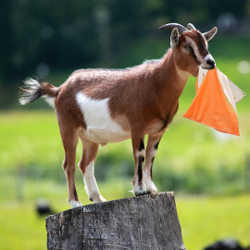 As usual, the top 15 finishers of the Goat received Golden Goat lifetime points. Full results are below, including a link to the updated Lifetime Points table. A huge thanks to Paul Ort and Deron van Hoff who went back out into the depths of the park to pick up controls after the event. Thanks also to another volunteer who picked up the controls around the finish​—​this really helped! A big thanks to State Park Ranger Betty Wong for helping haul water, controls, and volunteers into the far reaches of the park to facilitate course setting and pick up. Thanks to Jay Hann from Western Racing Services for managing E-punch, processing results, and bringing critical equipment to the event. Thanks to Tori Borish for pre-running the Goat and providing invaluable advice on the design of all four courses. Thanks to Josh Wiley for pre-running the Kid and providing important corrections for the map. Thanks to Nancy Lindeman for bringing and managing snacks, to Steve Hass for running registration, and George Minarik for getting the event permit and finding critical volunteers. Thanks to Tapio Karras for setting up RouteGadget for this event​—​being able to compare courses is extra fun on a Goat! Thanks to Bob Cooley for yet another masterful job of printing maps, to and Chuck Spalding for posting information to the website. Thanks to the many people who did small but vital things​—​closing gates, helping take down signs, calling folks together, and cleaning up the assembly area after the event. Note regarding RouteGadget for this event: RouteGadget handles Goats and Score-O's nicely, as it has an option to use split times to determine the order in which each competitor visited the controls. In a way, each competitor makes their own course. Martin Kunz stays at #1, even without participating again this year. Mikkel Conradi has overtaken Steve Gregg for second place, and is closing in on first place.